Retextured some of the Wasteland Fashion armors. I can't imagine what you would do with such a niche set of textures, but you'd have to follow the permissions set by Ascendia first. After that, I don't care what you do with this really. Ascendia for all the original textures I rehashed with my own stuff here. 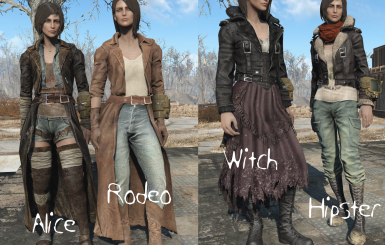 You will need Wasteland Fashion if you wanna make use of any of these. "Re-texes are always welcome, no need to ask" - as written by Ascendia in the FAQ for Wasteland Fashion. I re-textured the armors from the Wasteland Fashion mod, and liked how they came out so I decided to share them. It replaces the Hipster, Alice, Witch, and Rodeo sets (maxson cut-off included by extension). May look different depending on the mesh you use (Vanilla, CBBE, etc. ).